Anniversary of the Universal Declaration of Human Rights. Storytellers for Peace, an international network born in 2016, formed by storytellers who tell stories through clips, made a special one for this great occasion. The artists, as much the tales, come from all over the world and speak about justice, equality, human rights and peace. The project was created and is coordinated by Alessandro Ghebreigziabiher, author, playwright, storyteller and stage actor from Italy. Human rights regard all of us, not only artists or activists. 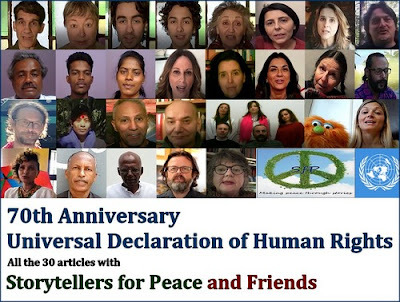 That’s why, Storytellers for Peace have involved in their new video also colleagues, relatives, friends, or anyone else who wanted to join the work. Because, more than ever today, we have to say that this wonderful Declaration is still the best words we have.